We had to say goodbye to our dear, sweet Jester boy last month. It has been difficult adjusting to life without him. His presence filled our lives for 12 wonderful years. We are now left with only emptiness and deafening silence. This month, my card honors his independent spirit. I chose one of my (many) favorite photos of Jester. This was taken on the beach behind my parents home and it was a special place where he loved to play. I love how this picture captures his regal, majestic stance. 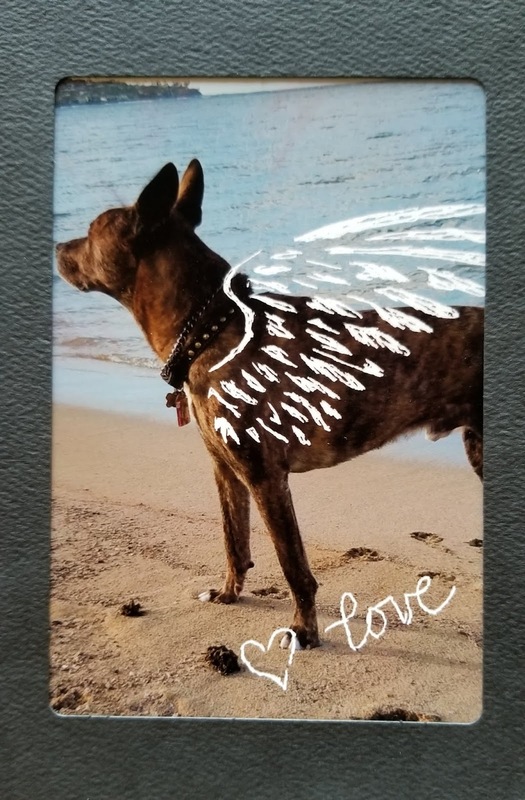 Since Jester has now crossed over the Rainbow Bridge and is in the company of angels, I decided to give him wings. These wings were created by spraying a mist of water over the photo, laying a wing stencil down and using an awl to gently scratch the surface. I think he wears his wings well. Jester was a very special companion to all whose lives he touched. He leaves a huge hole in our hearts but we take comfort knowing that his spirit is now happy, wild and free. Creating art in beautiful Honolulu, Hawaii!